Sproutlings is always happy to take book donations! If you are doing some spring cleaning and come across any children’s books, please feel free to bring them in! Parents, remember your key card. We have noticed that many parents are ringing the bell or waiting for another parent to open the door. If you have lost your key card, you must contact Kerry so she can deactivate your old key card and issue a new one. A reminder to provide the office with an updated vaccination record whenever your child receives new vaccines. We also accept the printed versions from the online portal. A Universal Health Record is required once a year after your child’s yearly physical. We had a great week in Peapod II. We enjoyed the nice weather and getting to go outside. Miss Kerry built us our own outdoor play spot! We shook our maracas and danced to some of our favorite songs. We also welcomed our new friends to the classroom that have begun their transition. As always, we love to crawl through our tunnel and push our walkers through the hallway. We sang “On Top of Spaghetti” and read I Love You Through and Through. It has been a great start to Spring in the Seedlings class. We had fun building towers. Miss Bridget brought in a giant cardboard box that we’ve been coloring and playing inside! We’ve been singing a lot! Our personal favorite continues to be “The Wheels on the Bus.” We especially like doing the hand motions for “move on back.” In the indoor playground we had a lot of fun with the balance beam and bean bag toss. This week in Little Sprouts we started to talk about Spring. We talked about how the flowers are growing and the weather will be warmer soon. We talked about what kinds of clothes we wear in warm weather. We got to spend some time outside. We love running around on the playground. Our favorite song this week was “We are the Dinosaurs.” We marched around our classroom pretending to be dinosaurs as we sang along. We have been learning all about what buildings are made out of! We learned that buildings need to be made out of strong materials like wood, bricks, concrete, and more. We read Construction by Sally Sutton and we sang a variation of “This is the Way” in which we pretended to use tools. We had fun working on our fine motor skills by completing construction site and tool puzzles. We worked on identifying and matching shapes in math and we decorated hard hats during art! We enjoyed working on spelling our names every morning and practicing identifying our friends names too! As always, we had so much fun exercising with Stretch and Grow. 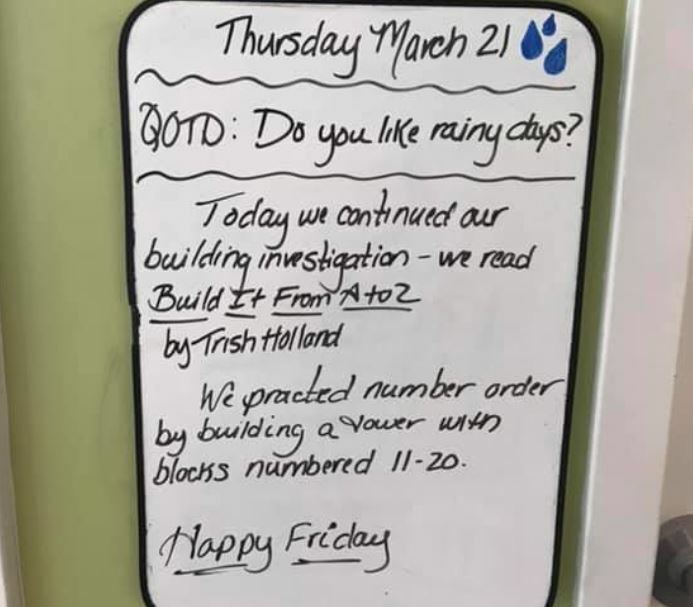 We will continue learning about building next week! It was a fun week in Saplings! Can you believe it’s already Spring? We answered the question “What do we see in Spring time?” The kids made flowers to hang up in the classroom. We talked about what animals wake up from their long naps in the Spring. In literacy, the kids continued working on their handwriting skills. This week the letter the kids practiced writing was the letter “Q” and they formed letters with sticks. Our story we read this week was The Three Little Pigs retold by Bonnie Dobkin. As a special treat the kids got to acted out the story. They did such a good job! Last week, we had a special guest come. Dr. Singh from Singh and Smile Pediatric Dentistry came to teach the kids how to keep their teeth strong and healthy! The kids learned what foods are good to eat and what foods are not good! Also they learned “sugar bugs” are not good for our teeth and we have to brush them off. In math the kids did a fun activity with finding a number and using a tooth brush to brush the sugar bugs off. In literacy we continued practicing our handwriting skills. This week we learned how to write the letter “O”. Large group this week we focused on building that are strong and sturdy and the materials that are used to make them. Our story this week was The Three Little Javelinas by Susan Lowell. Next week we are continuing our study on buildings. Have a great weekend!